It was a day when all the boxes were ticked for New Zealand. After winning the first two games comfortably, the Kiwis came into the dead rubber on a high, and won by a hefty 88 run margin. After losing the toss and coming out to bat first, New Zealand lost Colin Munro in their 5th over. The in-form Martin Guptill (29 off 40) was subsequently caught at the boundary line by a screamer from Tamim off Saifuddin. The partnership between Henry Nicholls and Ross Taylor made them cross 150 in the 29th over. The duo concentrated more on singles and doubles rather than going for the big shots until Nichols (64) got a top edge off Mehidy Hasan to bring Jimmy Neesham onto the crease. Taylor (69) made another 50-run partnership with Neesham (37) and enroute became the leading run scorer for New Zealand in ODIs, surpassing Stephen Fleming. Then Tom Latham (59 off 51 balls with 2 fours and 3 sixes), Colin de Grandhomme (37 off 15 balls with 4 fours and 2 sixes) and Mitchell Santner (16 off 9 balls) gave the finishing touches to extend the Kiwi innings to 330. After coming out to bat while chasing 331, the Bangladesh top order came under fire from Tim Southee. The visitors lost the top 3 wickets for just 2 runs within the third over. The fact that only one run was scored off the bat during the first 5 overs showed how defensive they went after the loss of those wickets. When they lost 5 wickets for 61 within the 15-over mark, the writing was on the wall. The only positive thing for Bangladesh was the counter-attack by Sabbir Rahman (102 off 110 balls) which comprised of 12 fours and 2 sixes, and a decent supportive knock by Saifuddin (44 off 63 balls). The two produced a a much-needed 100 run partnership to ease off their debt. 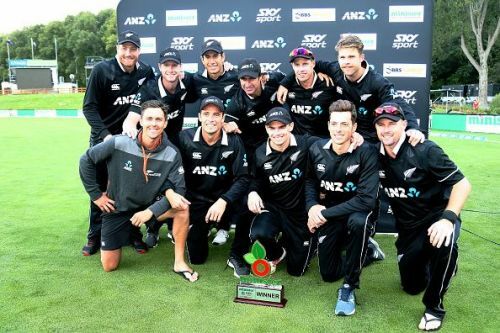 Southee was awarded the Man of the Match for his impressive 6-wicket haul and Guptill was awarded the Man of the series for his back-to-back centuries in the first two games. Keeping the World Cup 2019 in mind, the form of Guptill will be crucial for New Zealand. This victory made sure that the Kiwis stand unconquered at the Dunedin Oval, and Bangladesh remain unsuccessful at this venue.